It is not a historic quest, providing answers to commonly asked questions, but almost epoch-making in the fact that this book about Thailand has been written and published in Chiang Mai. Bravo! Three authors (Emmanuel and Ludovic Perve and Adrien Fontanellaz) who apparently gained their experience in Thailand (and the art of answering questions) while running guest houses, have put together this book “Answers to all your Questions about Thailand” (ISBN 974-93777-1-0), and published in December 2005, so it is current (other than the April 2006 (non)election and the disarray in the Election Commission)! It has been a small project of mine, to listen to the authoritarian bar-room lawyers and armchair experts pontificating at worst, advising at best, on all subjects Thai. Be that from whether a non-Thai can own a mobile phone, to even the very origins of the word “farang” used to describe us big-nosed, round-eyed foreigners. Incidentally, question number 133 in this book gives a very interesting alternative answer to the usual “francais” origin which supposedly came after the French envoys to Ayutthya in the 16th century. There was a descriptive term for Europeans at the time of the crusades, termed “Frank” and linguistic studies can trace this word as the origin of the Arab “faranji”, the Persian “farang”, the Cambodian “balang” and the Vietnamese “pha-lang-xa”, as well as the Siamese “farang”. The questions are divided into 11 broad sections, covering Practical Information, Nature, Food, Customs, Society, Buddhism, Arts and Traditions, History and Politics, Minority Ethnic Groups, Sports and Leisure Activities and finally, language. In the center of the book there are also several color plates featuring a map of Thailand and photographic images of some native Thai items of interest. The section on Minority Ethnic Groups I found particularly fascinating. For example, the reason why Hmong women do not divorce their husbands is that if they do so, they have to refund the bride price. If this were only the case in the western societies, I hear some of you saying! There are some answers which will no doubt prompt further bar-room discussions, for example, the percentage of the Thai prostitution scene which is devoted to catering to foreigners (if you just said five percent, you agree with the authors), and another on the origin of Kathoeys, and the fact that there was not just three genders in Thailand, but four! Turn to question 62 to get their answer. The authors do not go into much detail of their own bona fides, and there is no bibliography at the end, though there are several pages of recommended reading, so one has to presume that their answers were culled from the reference books. Despite the leap of faith regarding the answers, I did find this to be a good reference tool, providing the reader with good information about Thailand. It is just a pity they did not include more information on themselves and their sources, and an index. At B. 745, it is not cheap, but still reasonable value. Well worth looking out for at the local Bookazine, which supplied my copy. Bill Bruford cut his teeth playing in many British blues boom band’s in the mid Sixties. But finding that most bands expectations of a drummer were simply to count them in and keep time, Bill Bruford took a look around to find something a little more ambitious. This desire was fulfilled when he joined the formative Yes in 1968 with Peter Banks on lead guitar, Chris Squire on bass, Jon (then known as John) Anderson, and Tony Kaye on keyboards. Bill Bruford stayed with Yes through various line-up changes, and five albums, quitting for the first time during the recording of Yes’s triple live album Yessongs to be replaced by Alan White. Bill Bruford had been enticed away from the secure and lucrative drum stool of Yes to throw his lot in with Robert Fripp who had a desire to kick start King Crimson again. This was to prove to be the first of a trend where Bill Bruford would follow musical challenge, instead of financial security. During his time with Yes the great Buddy Rich had become an admirer of Bill Bruford’s drum technique, there being no higher accolade in the drumming world. When King Crimson fell apart Bill Bruford quickly found a place in the line-up of National Health, a group formed out of the ashes of Canterbury sound band Hatfield and the North. Bill Bruford also went out on the road with Roy Harper’s Band which included Chris Spedding on lead guitar. Over the years Bill Bruford has appeared on too many album sessions to mention in this review. At this time Peter Gabriel had just left Genesis after their Lamb Lies Down On Broadway tour. Instead of finding a new singer they simply moved the young drummer Phil Collins from behind his drum kit to front of stage to sing the songs. The trouble was, who was going to hit the skins? Phil Collins (no mean drummer himself) announced that the only drummer in the world he would feel happy with deputizing for him was Bill Bruford, so from March to November of 1976 Bill Bruford found himself as part of the tour band for Genesis. When Bruford and Collins found themselves behind their separate drum kits at the same time, it was a mighty sound. But this was not a permanent arrangement, so when the suggestion was made to form a new super group with like minded old pals Allan Holdsworth on guitar, John Wetton on bass, and multi instrumentalist Eddie Jobson, fresh from his stints with Frank Zappa and Roxy Music, the idea was put into motion and U.K. was formed. But after one great self titled album, divisions formed; Allan Holdsworth and Bill Bruford went off and formed Bruford for a couple of years, whilst the other two carried on with U.K. replacing Bill Bruford with another ex Zappa man Terry Bozio. Then in 1980 the mighty King Crimson raised its mighty head again and Bill Bruford joined the ranks for another four year successful journey. Then to add another branch between the two supergroups Yes and King Crimson, Patrick Moraz, the new Yes keyboard player left, and Bill Bruford left King Crimson to form Moraz / Bruford from 1984 -1986. After this Bill Bruford formed the first version of Earthworks with Django Bates and Iain Bellamy, allowing Bill Bruford to get back to his jazz roots. In 1986 Bill Bruford was asked to come back to the Yes camp (well sort of) to record an album with Jon Anderson, Rick Wakeman, Steve Howe and himself. This was fine but they were not allowed to use the Yes name, so the album was released under their own names Anderson, Bruford, Wakeman, and Howe (1988). Supplemented by auxiliary members Tony Levin (the bassist from Bruford’s King Crimson Days! ), Milton MacDonald on rhythm guitar and Julian Colberg on additional keyboards for the supporting tour. They could not use the Yes name as there was still a band called Yes led by original Yes bass player Chris Squire. When Bill Bruford once again got Earthworks back on the road, he regained his sanity. Then for the third time, Robert Fripp and his King Crimson came an asking. Bill Bruford found King Crimson in its double trio format of two drummers, two bassists and two guitarists on the same stage. This time it worked and from 1994 to 1997 King Crimson toured the Earth and neighbouring planets to great critical acclaim, releasing live albums and DVDs. But then the call of Earthworks became too much again, and Bill Bruford for the last time left King Crimson to put together a new Earthworks in 1998. There have been a few comings and goings in the line up as the band found their feet, but they have now settled on a comfortable stable line up of Tim Garland on sax and flute, an incredibly talented player and composer who has become Bill Bruford’s partner in the band and is best known before for his association with Chick Corea. The other two in the band are a perfect blend of youth and experience. The youth is supplied by Gwilym Simcock on keyboards who has already fronted his own band and was the winner of the BBC Radio Rising Star Award. Completing the band is the bass playing skills of Laurence Cottie. The music is definitely jazz based, but there are a lot of elements of Progressive rock in their too. Certainly the perfect blend to satisfy anybody with an ear for good music. Now it is time for the Earthworks 20th Anniversary tour, which fortunately for us includes Thailand. The promoter of the tour is Mark Bolam of Enlightened Planet, who has already brought another brilliant jazz drummer, Billy Cobham, to Pattaya on Saturday the 13th May at the Silverlake Vineyard. Billy Cobham played a storming set to great critical acclaim, and much appreciation from the local audience. 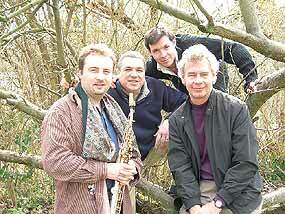 Bill Bruford’s Earthworks will perform at Mahison Hall l at SCB Park on June 1st 2006, and then will play a one hour set at the Hua Hin Jazz Festival on June 2nd 2006. Then on Saturday 3rd June Bill Bruford’s Earthworks will play at Silverlake Vineyard in Pattaya. The venue has a seating capacity of only 400 so be prepared to be up close and intimate with the artists. Siverlake Vineyards is run by the charming music enthusiast Dennis Dila who will of course be there at the show and more than keen to answer any questions you may have about future events at Silverlake Vineyards, and believe me the plans are big.